Trichinella spiralis and Tumors: Cause, Coincidence or Treatment? Background: Conventional therapeutic strategies for tumors have had limited success, and innovative and more effective approaches to treatment are urgently required. The ancient idea that various biological, bacterial, yeast, viral, and parasitic agents can be used as cancer therapeutics has gradually attracted considerable interest. Certain parasites have been widely discussed in association with human and animal tumors. 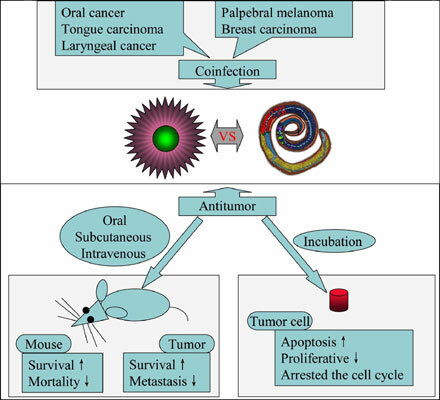 The purpose of this review was to examine previous literatures which investigates the relations between Trichinella spiralis (T. spiralis) and tumors. Methods: Using PubMed, articles published before 2018 in the whole world have been searched and comprehensively reviewed. Results: Many researches have provided proofs that T. spiralis possesses antitumor activities. The antitumor effect of T. spiralis was first described in the 1970s. However, its research has been inconsistent, and little progress has been made in this field. Therefore, the mechanisms underlying these inhibitory effects are still unclear, and convincing evidence of the links between T. spiralis and the prevention or treatment of tumors from clinical trials is absent. Meanwhile, some other researches also suggested that T. spiralis may cause or contribute to coinfection with a tumors. Conclusion: The review has highlighted the scientific literature focussing on evidence for T. spiralis to act as a pro- or antitumorigenic agent is summarized and discussed, in hope of contributing to a better understanding of the relations between T. spiralis and tumors. Trichinella spiralis, tumors, antitumor, tumorigenic, nurse cells, parasite.